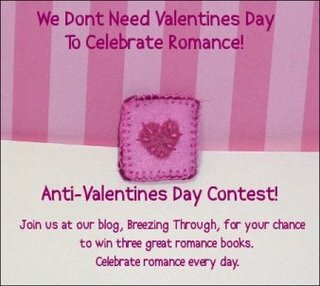 Via ReadingAdventures I found out about this Anti-Valentine's Day contest at breezing through. Which is a blog I hadn't been to before (and I like it, so on my feed list it goes)! I'm always fond of reviews that are like a conversation between two people, and that's the format used most often there. Prize is your choice of three books from three categories. Meanwhile I also saw a post by Marjorie J. Liu about a giveaway of a copy of Spiral Hunt by Margaret Ronald. I reviewed that book here. Contest ends Thursday so act soon. The link for that one is here. This entry was posted in Uncategorized and tagged contests, margaret ronald by janicu. Bookmark the permalink.